In this episode of the profit, Marcus visits skullduggery toys inc, a toy manufacturer in serious trouble. The company was set up in 1987 and is now run by “interesting” brothers Stephen and Peter Koehl. It is located in Anaheim California. Originally purchased by their father Peter Sr, it was previously a Museum-quality fossil replica maker. The core replica part of the business still accounts for 10% of the company’s income even though it is now a more traditional toy manufacturing company. Even with the very high revenue of over $1.5 million, skullduggery is still struggling with financial losses. Huge debt despite a healthy flow of revenue. Very low margins on their products. Lack of proper research and focus group consultation before launching products. Lack of proper advertising of the products. Hit and miss approach to product creation. A very kid toys non-friendly brand-name – skullduggery. 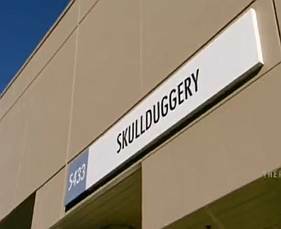 Skullduggery is losing money and the sales are dwindling. There is a $800,000 (even though Marcus later finds out it’s about $1.3 million ) debt in the business mostly caused by mistakes. the company has about $300,000 in inventory ( Marcus finds out that there is a total of $770,000 in assets). Marcus offers Steph and Peter to pay off skullduggery’s debt($1.1 million) and provide another $1 million working capital for 50% of the business. This offer is quickly shut down by the brothers. They don’t want Marcus to have controlling interest in the company. A bit later, Marcus goes to bring them back in and they finally settle on a deal of $1.1 million to clear the skullduggery’s debt in exchange for 30% of the business and most importantly, financial control to Marcus. Licensing products to more established brand companies. Narrow down the SKUs/products to those that sell and are profitable. Creation of a $100,000 toy lab for product development which will include a 3D printer. Proper testing and research of products with focus groups and children before development. Streamlining of the business to reduce cost. Total rebuild of the business premises to create a positive creative vibe. Marcus offers to beach NASCAR on behalf of skullduggery for a licensing deal with their toy race cars. Peter absolutely hates NASCAR and in his own words “he wouldn’t give a beep about NASCAR. They go to visit Steve Phelps, chief marketing officer of NASCAR New York and Stephen makes an absolute mockery of the meeting by asking NASCAR to pitch themselves to skullduggery. After so much money was spent on the total rebuilding of the office spaces, new machines etc, the show ends with the huge disagreement between Marcus and the Koehl family about the points of the deal. What I personally don’t understand is why this is happening now after all the investments made in by Marcus. If the father had something to say about Marcus’s deal then he should have stepped up right after his sons shook Marcus’s hand. The deal falls through. Marcus walks away and cuts his losses. This is another episode that leaves a sour taste in the mouth. Once again Marcus gets played for his good intentions. I hope you enjoyed watching this crazy episode as we did. Lots of important business lessons to be learnt and we hope you feel the same. Don’t forget to leave your fan comments here below and your thoughts on the episode. We really do rely on your comments for updates and information, so please share them with us. next post: Monster Truck SEO Review. Instant Rankings By Terry Kyle. REALLY?? ?